You are here:Home Closet Conference Attending ClosetCon 2019 Will Make You More Profitable! I know that’s a bold statement but hear me out. My success is directly connected to attending our annual trade show, becoming an ACSP board member and learning as much as I can. Believe it or not, my story isn’t unique – Wendy Scott who will be the next ACSP President has been a closet designer since 2005. She attended her first ClosetCon in 2014, which led to a new opportunity to help build a closet division for a leading kitchen company. This year she partnered with Patti Miller – you guessed it someone she met at the show and launched Boutique Closets and Cabinetry. When you attend the show this year, you can ask her for yourself if she thinks that she would be a business owner today if it wasn’t for ClosetCon. This year’s Closet Conference is loaded with information that will help you be more successful. Our keynote speaker is David Linda, if you have never had the pleasure of meeting him, he’s a straight shooter that launched a successful closet business in Houston, sold it and retired early. How many of you have been doing this for 20+ years and would love to sell your business? Do you know where to start? I bet this session shortens the learning curve. I have known David for years and I know this will be the best keynote in a long time. The next speaker is Lisa Carlquist, President of Artisan Custom Closets. She built a $9 million-dollar business in seven years and will tell you how she did it. If you’re having problems scaling your company, this session could be the most important thing you do all year. Next up are two panel discussions – Venturing out of the Closet and Trends in Design. If you are not creating an offering to focus on other rooms in the home you are missing an opportunity to sell more items at a higher price. Last week I discussed that on my blog – click here to see that post. He will discuss how he got the opportunity, what he learned and if it was worth it. The day wouldn’t be complete without our annual shop tour. 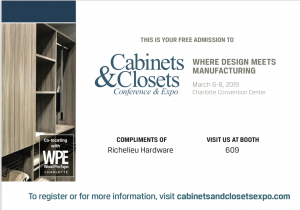 This year the tour is a visit to Carocraft Cabinets a 47,000 square foot facility specializing in commercial casework and millwork. If you think the networking ends there you haven’t been to a bar with a bunch of closet owners. With more networking and learning events on Thursday and Friday, the Top Shelf Design Awards Reception and over 100 exhibitors I guarantee you will learn something that will make your business better. This is the fifth of a series of posts focusing on becoming more profitable in 2019, head over to TheMayorOFHardware.com if you missed Parts I – IV. I look forward to seeing you in Charlotte, NC on March 6th.